We’re pretty sure this Wilfred Costume is the exact one that Jason Gann wears on the...OK, kinda weird but also awesome...TV show Wilfred. We mean it. This is the THE costume. Just ask Bear. Bear would know. Wilfred is a dog...er...rather a man dressed like a dog. The best thing about wearing this look is that you’ll be instantly appreciated by other fans of the FX show, and once you've formed a little posse you can trade your favorite moments back and forth all night. You can debate the oddity of Wilfred’s existence--how come we see him as a man in a dog suit? Why do others appear to see him as a regular dog? Why is he allowed to sit in chairs at restaurants? Once you finish that fun convo, you’ll notice that everyone just really appreciates having you around. Whether you’re real or not doesn’t matter, you’re man’s best truth-slinging, cigarette smoking, inappropriate friend. And what better night to get a bit absurd, really, than Halloween? We think none! 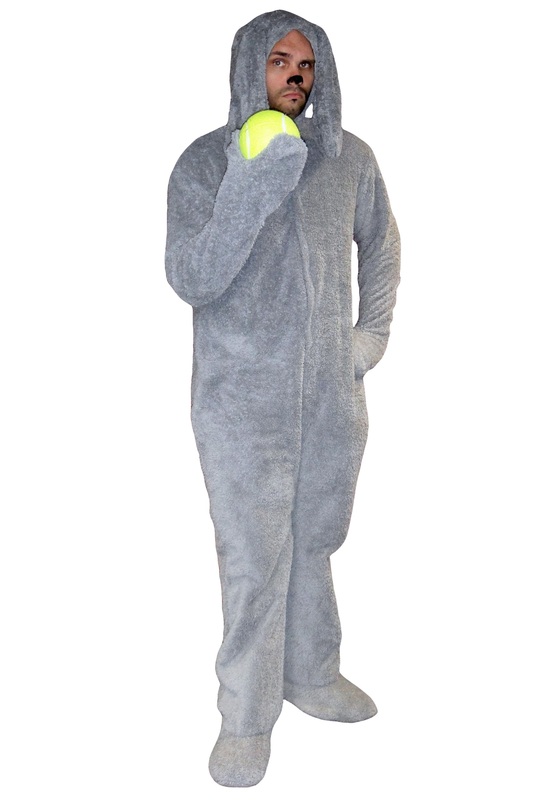 So throw yourself a bone and don the ultimate in dark humor looks, this cute-pup-meets-pop-culture costume. This faux-fur gray hooded jumpsuit has enclosed hands and feet, and as we said, is THE costume from the show (OK, maybe not the exact one, but that one probably smells like cigarettes and was worn for four seasons straight; we doubt you’d want it). Pick up a ball, a bone, a giant stuffed bear, or other...paraphernalia...and hit the scene with your best bud (it helps if he looks like Elijah Wood). We’ll just make sure no one leaves their boots unattended by the party’s front entrance. Bad Wilfred!